Habit: Annual, perennial herb, glabrous or strigose. Stem: prostrate or ascending, 1--10 dm. Leaf: irregularly pinnate or subpalmate, well spaced; stipules gland-like; leaflets 3--6, 4--10 mm, oblanceolate to obovate. Inflorescence: 3--8-flowered, peduncle 8--30 mm, bracted. 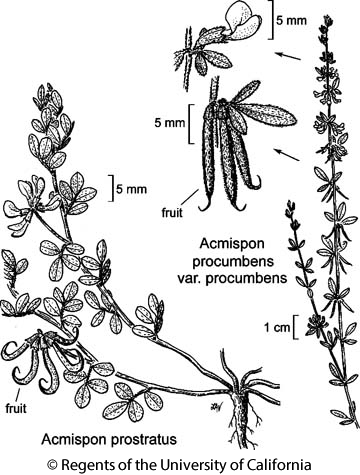 Flower: calyx 2--3 mm, lobes << tube, strigose; corolla 5--7 mm, yellow often with red, wings >= keel. Fruit: indehiscent, spreading or reflexed, exserted, 1--1.5 cm, linear, curved, not flat, occasionally with small horn-like processes; beak hooked, tapered, 2--3 mm. Seed: 2. Citation for this treatment: Luc Brouillet 2012, Acmispon prostratus, in Jepson Flora Project (eds.) Jepson eFlora, http://ucjeps.berkeley.edu/eflora/eflora_display.php?tid=91719, accessed on April 22, 2019.
s SCo (w San Diego Co.); Markers link to CCH specimen records. Yellow markers indicate records that may provide evidence for eFlora range revision or may have georeferencing or identification issues. Purple markers indicate specimens collected from a garden, greenhouse, or other non-wild location.